Your business is expanding, which means more recruiting, more onboarding, more timekeeping, more payroll processing, more benefits administration, more recordkeeping, more focus on retention; more payroll tax obligations; and more compliance efforts. You currently use a payroll service provider, but is it meeting all of those needs? Or, is it satisfying just your core payroll requirements? If it’s the latter, you’ve got a one trick pony on your hands—and it’s likely costing you in more ways than one. A one trick pony leaves you with two choices: either perform all of your other human capital management (HCM) functions in-house, or hire multiple vendors to fulfill them. The first choice means “ponying up” the cash to pay for an internal HCM infrastructure plus wages and benefits for your in-house IT, HR and payroll teams. The second choice means enduring the convoluted process of juggling different vendors and systems, which increases the odds of data entry errors and disjointed reporting if all of the systems are not in sync. Both of those choices come with increased cost, which can put a serious dent in your profit margin. 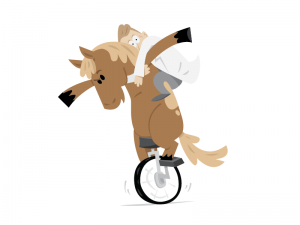 Ditch the one trick pony and get with a payroll vendor that’s evolving with the times. Specifically, find a vendor that delivers HCM solutions in one application. With this vendor, you’ll have everything you need to manage all of your people in a holistic manner, instead of just the core payroll side of things. Also, with the cost of employee benefits being a constant concern for many employers, you may want to consider a payroll vendor that can assist in that area. For example, Payentry offers retirement plan services and access to a workers’ compensation program, both of which are tailored to reduce associated costs and stabilize cash flow. Let’s give the one trick pony a bit of credit: it’s good at the one thing that it does. (It’s likely an expert in that domain.) Consequently, you may have reservations about a system that merges so many different HR elements into one application. The figure of speech, “Jack of all trades, master of none” may seem fitting. But, that’s a misconception. Remember, payroll is closely aligned to the other aspects of human capital management. Therefore, it makes sense to simply fuse everything together. Workflows will become seamless, as information only needs to be entered once, instead of into multiple systems. Everything will become much easier, and less costly. If the system is well built, all of the integrated moving parts will operate as they should. And it’s all done via a secure web-based platform, known as cloud technology. All your managers and employees need to access the system is a computer and the Internet. There’s a reason so many employers are adopting this technology at a record pace: it works. So, say goodbye to the one trick pony and hello to unified HCM.